How is your sales strategy and/or team really performing? Chances are there are different views regarding how well things are going – even different degrees of confidence regarding meeting or exceeding targets. As the manager your views regarding sales performance may be at odds with the views of other management colleagues in the business, as well as with members of the sales team. They may even be at odds with emerging marketplace trends, such as the moves of competitors or changing needs of customers. Getting a real fix on sales performance is key to personal and business sucess. Just how motivated, aligned and focused your team really is. In short it reveals a lot about your organization’s sales performance in order to protect managers from shocks and surprises. The Strategy Pitstop® helps managers to get a accurate fix on sales performance and potential from 4 different angles. One perspective is simply not enough. 4. The latest research into trends in buying. The data gathered enables managers to get an accurate fix on their sales’s team’s exact position – on it’s sales performance and potential. 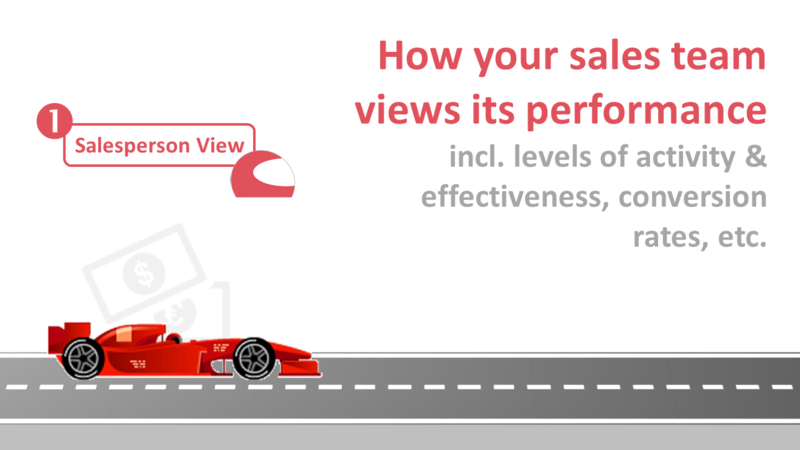 The Strategy Pitstop® begins by capturing data from each member of the sales team using a sophisticated (but quick) online sales assessment. It captures almost 5,500 data points for a team of 50 salespeople. Once managers complete the The Strategy Pitstop® assessment there response is compared/contrasted with the responses from the team. How your organization sells is plotted against best practice based on over 1 million pages of research and the publication of 3 books. Peer comparison data also enables managers to see how they are positioned relative to peers and competitors. The requirements of selling to today’s more sophisticated and demanding buyers places new requirements on sellers. The Strategy Pitstop® leverages industry leading research with buyers to ensure the alignment of sales skills and techniques with the requirements of longer and more complex sales cycles. This is key to the alignment of sales process with the buying requirements of today. It takes into consideration the increased power of procurement, the rise in competitive tendering and other related trends in corporate buying. From the 4 angles, managers are presented with a single composite picture of sales performance and potential. In particular key sales opportunities and challenges are highlighted, The Strategy Pitstop® generates personalized sales maps, rather than lengthy reports. These pin-point hidden sales potential, skills gaps and risks to target. Of course measuring sales performance, no matter how accurately, is not enough. Nor is calculating what the sales potential is. The Strategy Pitstop® does these things, but it does a lot more. It gets different stakeholders and team members working together to ensure greater alignment. In short it enables mangers and their teams to take focused action to accelerate and drive sales performance.